CiCiMobile provides you with affordable long distance calling to anywhere in the world from your smartphone through either the Call Back or Direct Dial feature. This service does not replace your existing cellular and local calling plans; it simply allows you to stop paying the high long distance rates charged by your cellular provider. The minutes you purchase never expire and there is no contract, monthly fee, maintenance fee or connection fee. Do I need a special phone to use CiCiMobile? All you need is a smartphone to download the CiCiMobile application. 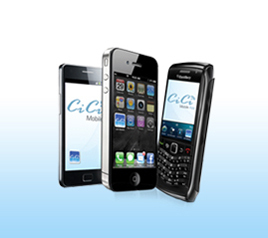 Click here to view available smartphone operating systems that can work with CiCiMobile. You are not required to use your PIN when placing a call from your phone. Once the application is downloaded to your phone and you make calls using the CiCiMobile application, we authorize you by your phone ID and allow the call to be connected. Do I have to cancel any existing services before my account will work? When you use this service, our system knows you are a customer by recognizing your phone number each time you dial into the service. Does CiCiMobile work with my current wireless phone provider? Yes, CiCiMobile works with all Canadian and USA providers including Rogers, AT&T, Fido, Telus, Bell, etc. Will I be able to use the address book or scroll feature on my cellular phone to make long distance calls? For BlackBerry® users, calls can be initiated from your phone book, from your call history list, or by dialing your destination number. Once you have selected or entered your destination number, press the BlackBerry® menu key (the logo key with the dots beside the green dial button), and you'll see an option in the top row of the menu: "Use CiCiMobile Direct Dial" or "Use CiCiMobile Call Back". Click on one of these menu items to submit the request to connect your call. For iPhone® or Android™ users, calls can be initiated from the contact list provided in the CiCiMobile application or by simply dialing the destination number after the application is launched. The application will pull the contact information from the iPhone® or Android™ contact list. Can I use CiCiMobile while travelling? CiCiMobile can be used from smartphones from most worldwide locations. Please contact customer service for further details. How do I cancel an incoming call back request? Once you have requested a call back but no longer wish to proceed with your call, please be sure to answer the call back request and hang up immediately. If you do not do so, the call will get connected to your voicemail, if you have the voicemail feature, and will be deducted from your CiCiMobile prepaid balance for the connection. How can I uninstall the CiCiMobile application from my phone? What version of Smart Phones is the application compatible with? Can I send a call back to an international number when using the Enhanced Call Back feature? No, call backs can only be received on a phone number in the U.S. or Canada. Your account will be available for use with 60* minutes of free calling time to Canada and USA immediately after you download the application. Purchase a CiCiMobile recharge card from a participating retail location and visit the Recharge page online or contact customer service at 1.866.768.6888 to add the funds to your account. Your account and account balance will expire two years after the last use. How do I check my account balance / talk time? You can check your account balance online once you login. Your available minutes to talk are announced each time you make a call. Go to the Register/Install page and complete the online registration form. You will be sent an email with the link to install the CiCiMobile application on your phone. How many phone numbers can I activate to my CiCiMobile account? You can activate one phone number to each account. The CiCiMobile account is registered to your phone number and your calls are authenticated through your phone number. You will have to call customer service and cancel your existing account and have a new account set up with your new phone number. The unused balance of your existing account will be transferred to your new CiCiMobile account. What happens if I get a new device without changing my number? You will need to install the same application again onto your new device. In order to install the application, you will have to access the same link from your phone that was sent to your email when you originally registered (if you no longer have the original installation link on your phone you can simply re-send it to yourself from your PC). On your BlackBerry® you can either enter the CiCiMobile Installation Link on the browser or click on the link directly from your email and follow the same steps to download and install the application. On your iPhone®, you will need to sync the application through your iTunes® account. Once completed you will be using the same CiCiMobile account as previously used on your old device. On your Android™, open Android Marketplace (Google Play™). Find CiCiMobile app and tap install near the bottom of the screen. Simply read and agree to the terms and conditions and the application will install. What do I do if the CiCiMobile application has been deleted from my device? Android™ users please search for CiCiMobile in Google Play™ and reinstall the application. Please note you will have to enter the username and password you created upon your original registration. Both Canadian and United States users can check rates by clicking here. To see calling rates to cellular phones overseas, please click here. You will not be charged by your cellular provider as long as you are using the Call Back feature to make your calls and you have an unlimited incoming call plan with your provider. If you use the Direct Dial feature or do not have an unlimited incoming call plan you will be charged for minute usage based on your cellular plan. You will however not be charged long distance rates from your cellular provider. Do I consume any data when using the CiCiMobile application for long distance calling? Yes. Placing a call using the Direct Dial or Call Back feature requires a small amount of data (less than 300 bytes). For your reference, 1MB of data will allow almost 4000 call back requests. We have optimized CiCiMobile to minimize data consumption as much as possible without compromising any functionality. What if I am travelling outside of my local mobile calling area and wish to use CiCiMobile? If you are travelling outside of the local calling area of your mobile service provider, the rate per minute charged by CiCiMobile will not be affected. For example: if you have a Canadian service provider travelling to USA and wish to call from USA back to Canada, your rates will remain the same as if you were calling from Canada to a Canadian destination. Roaming charges and other fees may apply based on your service plan. Please check with your service provider for details.